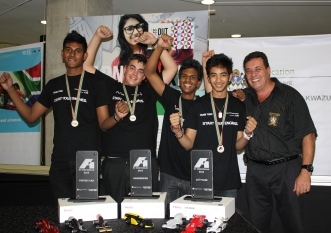 Following the success and impact of the 2012 and 2013 Top Gear legacy Initiative’s F1 in Schools Technology Challenge, Anna Sacks, Legacy Initiative Project Manager, announced on Wednesday (October 16, 2013) that the competition will once again be held in KwaZulu-Natal (KZN). This happened at the Durban University of Technology’s (DUT) Steve Biko Campus during a meeting with teachers employed in technical high schools around the province. Here, Sacks invited the educators to form teams in their respective schools and partake in the 2014 challenge. The F1 in Schools Challenge is a collaborative initiative between Top Gear, DUT, Sangari SA, The KZN Department of Education and Autodesk. It is an exciting project that is geared towards encouraging high school pupils to pursue careers in engineering, science and technology after high school, fields which are the backbone of an economy. Maths and Science therefore play an integral role for pupils who participate in this competition. The challenge will see teams of between three and six pupils in grades nine (9), ten (10) and 11, designing and manufacturing miniature versions of the Formula One car of the future. The 21cm long cars will be designed using Computer-Aided Design software (CAD), built from a block of balsa wood and powered by a compressed air cylinder. As a starting point, the schools will be trained on how to use the design software during workshops which will be held by the Department of Industrial Engineering at DUT. Although the dates have not yet been confirmed, the workshops are scheduled to take place in November 2013, Sacks said. “The aim is to have teams ready with their prototypes by January. In February, the prototypes should be raced in a mock race. Then, between February and March, teams will have the chance to improve their models. By April, teams should be submitting their cars to DUT for reviewing,” she said. The Industrial Engineering Department will also assist teams with the manufacturing process. The groups will be tested on a variety of areas which include marketing, team work, design, car speed, manufacturing, aerodynamics and branding. They will also have to source sponsorship for their projects and will thus be tested on this as well. This year’s (2013) challenge was held from February to June. A total of seven high schools and eight teams entered the competition. Given tight deadlines, the groups worked tirelessly on their F1 models, each producing ingenious designs. It was George Campbell Technical School’s Team Torc that eventually reigned supreme with the fastest racing speed as well as with the overall best project. Team Torc members were also invited during the meeting to speak about their experience during this year’s challenge. They were accompanied by their teacher Jorge Goncalves who encouraged teachers to partake in this “exciting and beneficial” challenge. “This was a learning curve, not just for me, but for the learners also. Yes, it’s difficult in the beginning because of the extra time you spend working on the project but it’s worth it in the end,” he said.